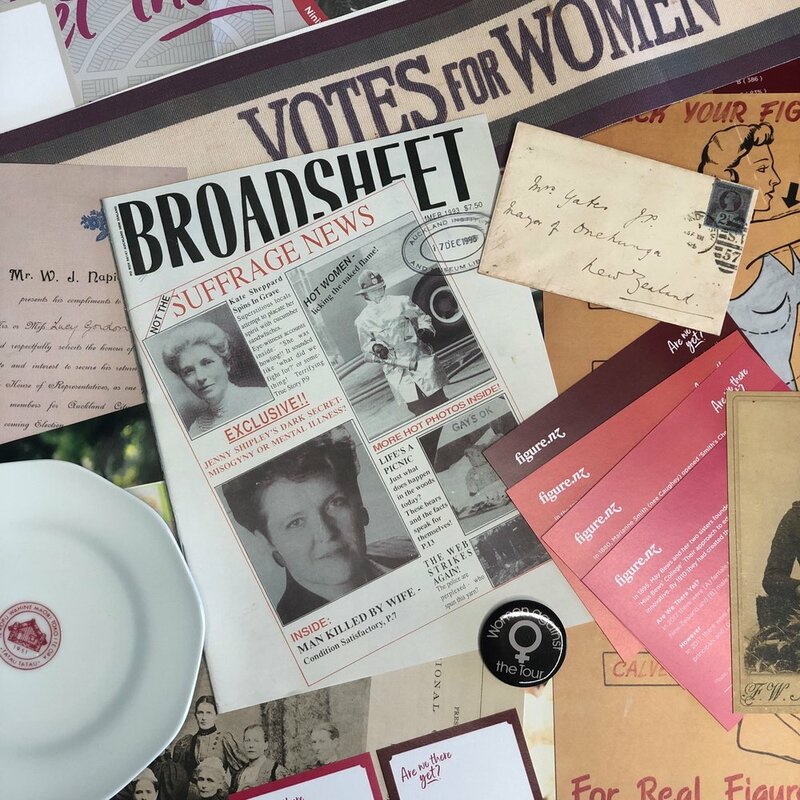 In here you should have three A3 reproductions of documents from the Auckland Museum Collection; a series of ephemera items including a badge, an envelope, a plate and a suffrage sash; a small packet of A5 documents, 4 sheets of vinyl decal frames and a Fact Sheet. Q: Where do we set up the exhibition? A: That is entirely up to you. Some classes have arranged to create a display in a space that is accessible to a wider audience, such as the local library or the local Council/Museum. Others have simply chosen to clear an area within their class and share their learning there. Schools that have more than one class registered to use the kit may like to consider creating an exhibition together and having an opening. Q: Who do we interview to create the exhibition? A: We suggest that you have that conversation with your students about which group of women to interview and we guarantee they surprise you, with the range of ideas they come up. There have seen a magnificent range of themes thus far, from Grandmothers of students to refugee women connected to your school. There have been interviews with past Head Prefects through to conversations with inspiring present teachers. We encourage your classes to explore the options and know they will learn so much. Q: What do we do with the decal frames? A: The frames have been designed to help your class feature the images and written work, in their exhibition. They are printed onto self adhesive sheets, so the individual shapes need to be removed and will attach effortlessly to clean, flat surfaces.The frame corners can be added to highlight written pages, photos or items from the kit can go inside the full frames. Attaching the decals to glass is particularly successful, so consider an exhibition space that will allow you to utilise glass. Q: Are we expected to do everything in the kit and on the website? Teachers of all levels need to look at the 'Tell' section in the website, as it provides information about how to create your own exhibition. The sections listed on the menu bar get progressively more challenging from left to right. i.e. Year 7 & 8 classes, we suggest you explore: 'Know, Listen or Rediscover'. A: It means that is the minimum expectation and it is what you have agreed to do, when registering for this kit. In this instance you agreed to have students interview at least 8 women from your community and then to present that information in your own mini exhibition. There is a date that you agreed to send us feedback by, for the Are We There Yet? Kit and that is 31st March 2019. Feedback will be in the form of responding to a few very short questions, on a link we will send you closer to the due date. You will be asked to upload a photo or teacher feedback there also. It is not designed to be an arduous task- it is what we use to help us deliver the best resources possible and the sponsors of the kit will get to see them what wonderful learning is taking place in classrooms across NZ, thanks to them. Q: What do I do if I need an extension for the AWTY Kit? A: All we ask is that you talk to us. You can phone any one of us ( a phone number will appear at the bottom of an email you have received from us), or email us on hello@schoolkit.co.nz We are not fussy about how you make contact, but love you to let us know if you can not meet the agreed deadline. When making contact tell us when you can have the feedback to us by. We are very reasonable and understanding here at School Kit HQ, so will simply add a note to your file and then you will not be contacted again until we have received the feedback, by the new date you suggest. A: Join the School Kit Face Book Squad, if you are not already a member and then search ‘Are We There Yet?’ You will see all the postings that teachers have shared. This is a great way to glean ideas and you may see something that sparks an idea you may have never thought of. Remember to check out the Teacher Feedback above for this kit.